The bars protect the spine and distribute pressure from the rider’s weight evenly across the horse’s back. Larger riders and performance saddles need longer bars to give more contact area to distribute pressure. The tree has two main factors that determine the fit; gullet width and bar angle. The combination of the two factors makes for slight variations in the saddle industry. There are not any standards or definitions of specific tree sizes, but each saddle builder provides a description to give an idea of the size of horse the tree should fit. 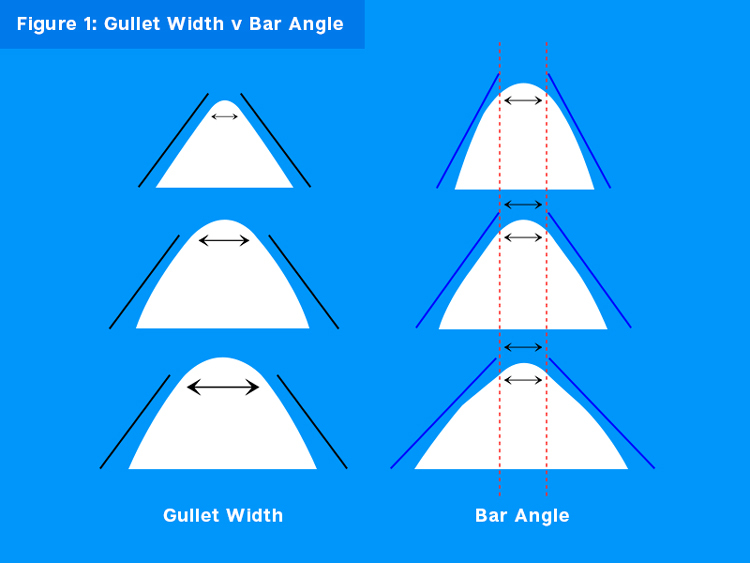 Gullet Width or sometimes referred to as bar spread is the measurement 2 inches below the narrowest part of the gullet, even with the side conchos. This is the most common factor because we can measure it more easily. When measuring, make sure you’re underneath the bars, not in front of the saddle. A narrow gullet width will keep the saddle perched higher. A wider spread will drop further down on the horse’s back. Bar Angle is not often measured but the angle needs to be as close to the angle of the horse’s back as possible. A narrow or tight angle will make contact at the bottom of the bars, not the top. A wide angle will make contact at the top of the bars, not the bottom. Bar Flare: The bars will flare to some degree in the front and back of the saddle. The front will flare away from the horse to allow for shoulder movement. The back may flare to keep the bars from digging into the croup. Bar Slope or Rock: The curve of the horse’s topline should be as close to the shape of the bars as possible. Bridging: When the bars make contact in the front and back of the saddle, but not in the middle. It causes what looks like a bridge across the dip in the back. The weight of the rider is carried only at the ends of the bars causing a lot of pressure that can result in white hairs and sores. Rock: when the bars bend more than the horse needs. This is the opposite of bridging and less common. The saddle may tip forward, though that could also be from a saddle that is too wide in the front. Rock is found on horses with a flat toppling. Semi-QH: Semi Quarter Horse can be referred to as Medium, Regular, or QH bars. This tree size has a higher pitch or angle to the bars. It’s for the horse with a more defined wither. (1/2 Arab, Appendix, Thoroughbred, etc). Arabian: Have a narrow front (usually 6.5" – 6.75" gullet) similar to the Semi-QH bar but the back of the saddle has a flatter pitch angle. So the saddle goes from a little narrow in the front to flatter or wider in the back. Can sometimes fit non-Arabian horses. Haflinger: Short backed, mutton withered – these trees have a flatter pitch to the bar angle and very little rock. Usually a 7.5" gullet, they’re often used on other large horses needing an extra wide tree. Draft: Usually an 8" gullet to fit on large draft horses. What do white hairs tell me? Normally, white hair is caused by a lot of pressure in one area over a long period of time. What takes place is the pressure stops the blood flow to that area which in turn kills the sweat glands and causes the hair to turn white. The hair may never turn to it's normal color. (You should consult your veterinarian about any sores your horse may develop.) See Signs of a Poor Fit. What about padding-up or saddle pads? Good saddle pads can cause the saddle to fit better. There is much technology in the pad industry to help a saddle fit better and you should take advantage of that technology. However, padding-up under a tight fitting saddle is not a good choice. Padding up would be like wearing extra socks in tight shoes, it’s only going to make the fit tighter. It’s common to use padding to help fit on hard-to-fit horses. Many times gaited saddles are also used on horses with higher withers and broad shoulders or muscle atrophy issues. See Hard-To-Fit Horses. Where do I position the saddle and how will the rigging affect it? Saddle position LINK to Saddle Positioning is important to fit. You want to make sure the bars of the saddle are behind the shoulder or scapula, not on top of it. The rigging position could affect how the saddle may fit as well. Full rigging puts more pressure on the front and keeps the saddle from sliding forward. 3/4 rigging position will sometimes keep the saddle from sliding back, while also taking pressure off the front of the saddle. Most saddles come in 7/8 position rigging. See Rigging Positions.